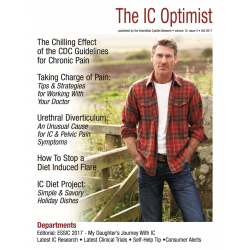 IC Optimist Summer 2013 issue for patients struggling with interstitial cystitis, bladder pain syndrome and chronic pelvic pain. (1) Guest Editorial: A Letter to My Chronically Ill Patients - Dr. Rob Lamberts offers seven essential strategies to help you work with your physicians better. A medical renegade, his blunt honesty and humility capture the growing frustration that many physicians feel about the medical care system. He offers sage advice! 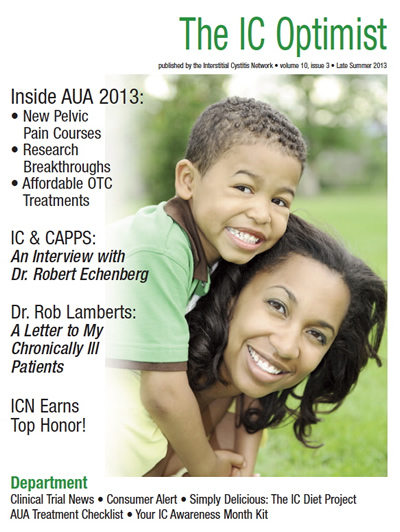 (2) ICN Earns Top Honor - We're just tickled to have been named, yet again, one of the best websites on IC/BPS. This international study from the University of London gives the ICN the top honor and recommendation on the internet. 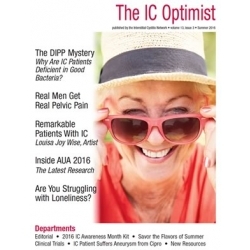 (3) IC & CAPPS: Dr Robert Echenberg Discusses Complex Abdominal & Pelvic Pain Syndrome - If you've been confused about the connection between IC, IBS, endometriosis, vulvar or prostate pain and PFD, Dr. Robert Echenberg offers insight into what is now considered more of a regional pain syndrome. He shares information on diagnosis and, more importantly, treatment. If you've struggled with more than just IC, you are certainly not alone. (4) Inside AUA 2013 - In our feature article, we offer an in-depth review of the 2013 American Urology Association annual meeting, which brought together the best and brightest IC experts from around the world. Two fabulous new courses were offered along with dozens of new, promising research studies. No longer does the urology community doubt the presence of IC/BPS. In fact, it was one of the "hot" topics at the event. (5) AUA Treatment Summary - Are you aware of your treatment options?? We've created a new two page summary of the AUA guidelines that you can share with your providers as you consider therapies. (6) AUA Treatment Checklist - A three page checklist of treatment options, with a discussion of both the pros and cons, that you can use to track your treatments. (7) Clinical Trial News - Two new studies have been launched for patients in the USA and Canada. Learn more about how you can participate. (8) Cool & Quenching Summer Drinks - We've still got plenty of hot days ahead of us. Are you tired of drinking water or milk? The new IC Diet Project, "Simply Delicious: Low Acid Eating Made Simple," offers three new recipes to quench your thirst: infused spa water, italian sodas and herb sweet teas. (9) Your IC Awareness Month Kit - It's time to spread the word about IC/BPS in your local community! 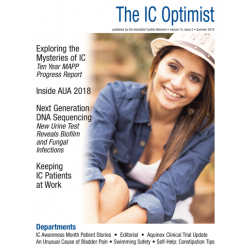 September is IC Awareness Month and we've included several items that you can use as an IC activist, including a press release for your local paper, a proclamation, social networking ideas and a poster on the back cover of this magazine. We all must speak out! Please join us!